The unprecedented public backlash to the FCC’s plan to slash Title II net neutrality protections continues to grow. And the pressure is working: Ajit Pai’s proposal is losing support with Republican lawmakers. The first GOP representative has just called on the FCC to delay their vote, and several others have criticized the plan. 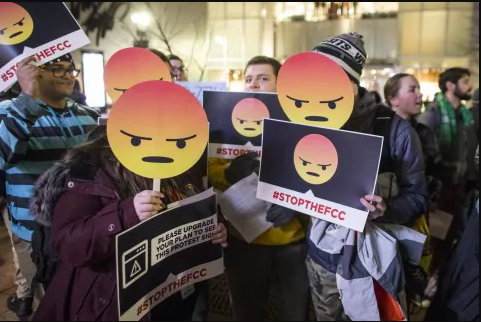 After thousands of people took to the streets to protest last week, the Internet is now ablaze in protest again as major websites like Reddit, Mozilla, Kickstarter, Pornhub, Pintrest, Etsy, and Tumblr, and Internet users across social media platforms #BreakTheInternet and flood Congress with phone calls, tweets, and emails. See screenshots of how the Internet is protesting here. “Ajit Pai’s proposal to let Internet Service Providers control what Internet users can see and do online may get a vote this week, but he has already lost. The FCC’s planned net neutrality repeal has sparked an unprecedented backlash from Internet users across the political spectrum. It’s unlike anything I’ve ever seen in my life as a digital rights activist. The telecom lobby spent millions trying to paint net neutrality as a partisan issue in order to get the Republican party to help end it. But this backlash shows that net neutrality is supported by people from across the political spectrum, and it’s so big that now even conservative or bought out lawmakers can no longer ignore calls from their own party’s constituents to protect the rules. Internet users are furious, educated, and strategic. They know that Congress has the power to stop the FCC or overturn their decision. It’s impossible for lawmakers to hide from their constituents on this issue. As the widespread opposition to Pai’s proposal reaches a boiling point, millions of people, organizations, and online firms from the tiniest blogs and small businesses to some of the most popular websites in the world are jumping into the fray. And Congress is cracking under the pressure. In the last week we’ve seen a slew of Republican lawmakers publicly speak out in support of net neutrality and criticize the FCC’s rush to dismantle it. Ajit Pai has created a political crisis for his own party. Congress members have read the writing on the wall. They’ve heard the droves of phone calls from their constituents. They’ve seen the power that the Internet has to defend itself. Fight for the Future will make a major announcement following the FCC’s vote. Members of our team are available for interview. Contact: press@fightforthefuture.org with all requests and follow us on Twitter for breaking updates.